We arrived early so we could view the Christmas decorations. There was a beautifully decorated Christmas tree, gingerbread houses, and a custom-made “Twelve Days of Christmas” display. In one nice little touch, one of the gingerbread houses in the display was of the Carolina Inn itself. Afterwards, it was time to enjoy the tea. There were lots of choices on their Holiday Tea list, inclding a number of special teas that are only available from December 1 to December 31 – such as the Jingle Bells tea, the Rudolph the Red Nose Reindeer tea and the Frosty the Snowman tea. It’s clear that the hotel dining staff put a lot of time and care into making every aspect of the holiday tea feel special – including the use of special vintage china cups. One of my favorite things about afternoon tea is the scones, and the Carolina Inn had two different kinds. Plus they gave us an extra one to try as well. (What a charming extra touch!) The tea sandwiches were outstanding and with each one they added a little extra flair to them, and that took boring to extraordinary! The pimento cheese had a kick to it, the ham had a small pickle and a mustardy dollop bursting with flavor to set the pickle on top. Of course, they also had a wonderful cucumber tea sandwich. And, just like the tea sandwiches, the desserts were also special in some unique way. For example, their take on a mini-pecan pie using peanuts instead of pecans was quite a nice twist. In terms of desserts, the chocolate-covered strawberry was good, but one of my favorites of the tea desserts was the chocolate-covered blackberry (I love blackberries!). The room the afternoon tea was in was nice and festively decorated. (Although, for some reason, there were also several snake pictures on the walls that were probably part of some previous exhibit at the hotel). There was also a palpable buzz in the room that made the whole experience feel special. 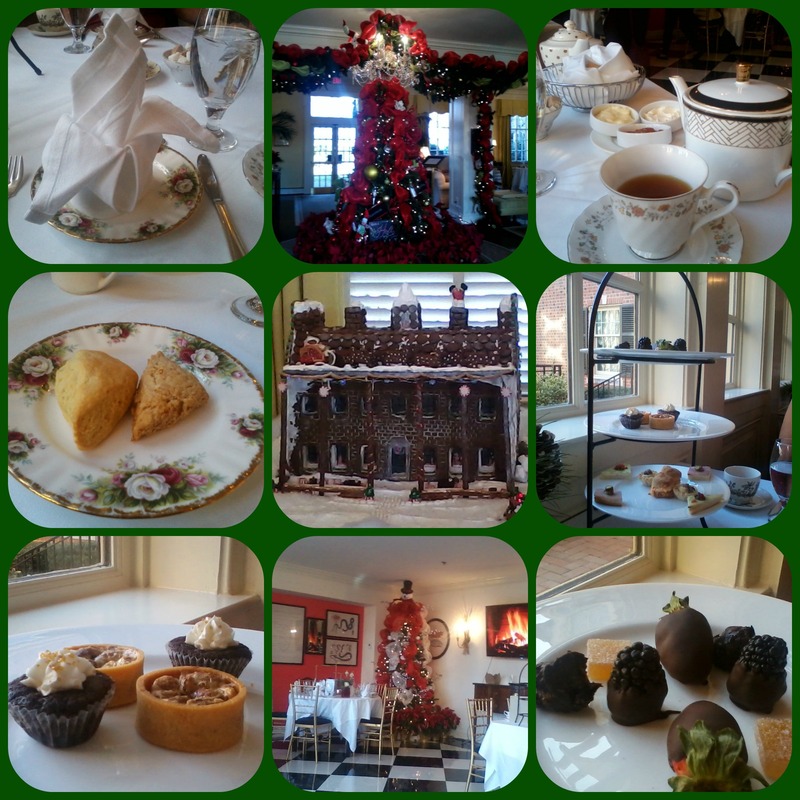 This being a holiday tea, we expected a certain amount of fabulousness on the part of our fellow guests. For example, I wore a hat to tea, and my friend wore a fascinator, but no one else was wearing one. While the entire experience was extraordinary, just one word of advice – be prepared for a slight wait during the holiday season, even if you’ve booked a table in advance. There are various events going on throughout the hotel, and sometimes the hostess staff can get a little overwhelmed by it all. But no worries – it is the holiday season, after all. Plus, there’s a cozy hotel lobby where you can wait for your table to be prepared. Overall, there’s a good reason why the Carolina Inn has become a favorite destination in North Carolina for people to enjoy a traditional afternoon tea during the holidays. If you are looking for a charming new place to take in the sights and sounds of the holiday season while enjoying a festive afternoon tea, it’s certainly worth the drive to Chapel Hill in December.